Many Informatics professionals spend time untangling these 'spaghetti-bowl' workflows, optimizing them, and making them look like the "AFTER" category above. But how exactly do they do this? If it's a cupcake you want, then it's helpful to follow the cupcake recipe. While the eight steps in blue above make a good introduction - the earlier gourmet recipe fills in more details. 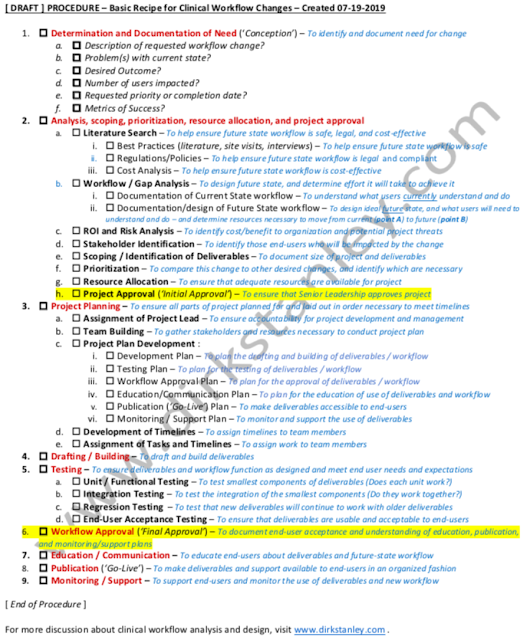 It also highlights the importance of detailed analysis work before even scoping or planning a project. Learning a good workflow change recipe (the basics of project scoping, planning, and execution) is vital to building solid, predictable workflows that meet all the right needs : Clinical, financial, and legal/compliance. For small projects, you don't need to make elaborate efforts for each step. Just being aware of each step will help you avoid pitfalls. It will make you a better informaticist, clinical project leader, and clinical workflow designer. It will help you work quickly with IT analysts, to build the desired workflows you're looking for. The investment in analysis and planning time will usually more than pay for itself in not having to troubleshoot or rebuild workflows after your go-live. Skipping one or more of those steps, or doing the steps out-of-order, may lead to unexpected outcomes in your desired project or performance improvement initiative. What these recipes do raise, however, is a common clinical informatics question : Who exactly should be responsible for each step? The IT analyst? The clinical staff? The regulatory and finance staff? The project manager? It's helpful to start with your IT and Informatics teams, look at each step, and discuss who would be the optimal person to do each step, before you bring the discussion to additional stakeholders for buy-in. Remember - Planning, and planning ahead, are vitally important to success. These recipes can help you do that. 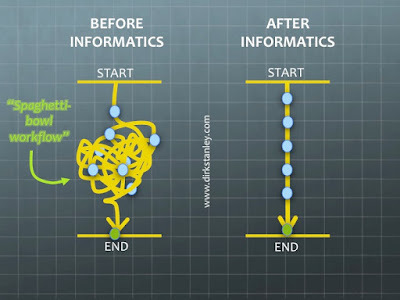 Hope this generates some good discussion with you and your analyst and informatics teams, before you tackle your next project. If you have any feedback, thoughts, or favorite change recipes - Please feel free to share them in the comments section below! Best of luck with your upcoming clinical workflow changes! This page is for educational purposes only. Open discussion is encouraged, education is a priority. Have any thoughts or feedback? Feel free to leave them in the comments below!